Some readers of this blog will probably wonder why I first discuss the issue of bees’ swarming, although we inform primarily about a conceptually new Thermosolar Hive™. I do so because the bees develop very fast in Thermosolar Hives™.On the one hand, that brings many positive effects. 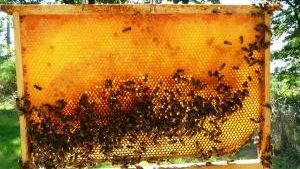 Colonies supported by the sun heat grow rapidly, consume a minimum of honey for heating broods, bees are soon ready for breeding mothers and creating splits. Also, honey yield grows considerably: by about 50-100% compared to other hives. Annual world production of honey amounts to 1.66 million tons (FAOSTAT, 2013). G. Liebig (1998) states that in the German farms about 30% of hives swarm and do not produce the expected profit. This is a long-term average, which probably applies to most other breeds. In many states where beekeeping is carried out in large-scale industrial conditions, the swarming tendencies percentage is at least similar or higher, while from the global perspective countries focused on large-scale breeding (Argentina, Mexico, China etc.) produce the most honey. It can, therefore, be expected that if undesirable swarming was eliminated, world honey production would increase by tens of per cent. Suppressing of swarming moods would allow beekeepers to breed more colonies, swarming would not temper their collecting instinct. The absence of swarms would also help reduce the percentage of diseases potentially transmitted. The number of wild bee colonies would decrease; wild colonies escape treatment interventions and die within a few seasons of Varroa mite infestation, which creates infectious pressure on other colonies. Suppose the world honey production increased by the above quoted 30%. In such case, the yearly 1,660,000 tons would amount to only 70% of possible global production. That would mean a yearly increase by approx. 711,000 tons, i.e. to 2,371,000 tons. Therefore 1,947 tons would be saved daily. This converted to smaller time units means 81.1 tons per hour, 1.35 tons per minute or 22.5 kg per second :-). Note that honey is an energy concentrate with a very long shelf life. It is a single agricultural commodity that can be produced in both natural and artificial ecosystems without damaging them. This could be successfully utilized mainly in developing countries, trying to address the food crisis. Varroa mites or small hive beetle (Aethina tumida) survive in a flown swarm. It is worth mentioning that undesired swarming had caused the escape of first swarms of African bees in the Americas, which eventually led to a number of serious problems. I point out these well-known facts in order to demonstrate the global importance of research in anti-swarming measures. In order to control a natural process, we must first understand it completely. Therefore, let’s first take a look at how honeybees’ swarming is interpreted today. Eventually, I propose new views on the issue and provide a new solution to the problem of bees swarming tendencies.